Student organizations began in 1888 with the founding of a literary society - then it disbanded after the founder left Storrs. In 1893, two new literary societies formed: the Eclectic for men and the Ionian for women. In 1894 the two merged into a co-ed Eclectic Society. But by 1899, there was a new literary group just for women:, the Alethia Society. 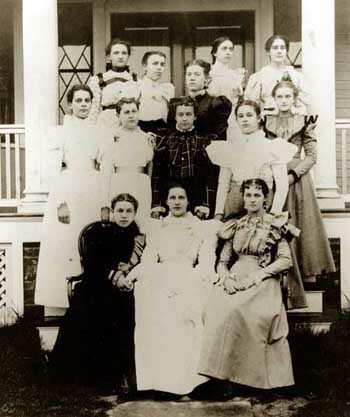 Shown is the Alethia Society membership in 1899, on the steps of the women's residence hall, Grove Cottage. Earlier that year, Storrs Agricultural College became known as Connecticut Agricultural College. Front: Marie Brown '00; Sec. Edith Latimer, '00; Pres. Gertrude Grant, '00 VP. Second row: Lena Latimer, '00; Florence Swift, '00; Olive Ballard, '00; Catherine Yale, '99; Bertha Squires, '00. Top row: Hester Hall, '00; Selma Carlson, '99; Anna Jacobson, '00; Elsie Leach, '99; Ida Hobby, '99.